Today is the anniversary of the Battle of Quatre Bras.Â Never heard of it? Well if I mention a more famous battle that happened 2 days later – The Battle of Waterloo – you maybe now understand the campaign that I am talking about. Waterloo was the climatic battle in the wars that started shortly after the French revolution and ran on through the 1790s on as far as 1815. From around 1796 onwards they became increasing focused around the ambition of one man: Â Napoleon Bonaparte. Napoleon had led a series of Campaigns across Europe and at one point ruled lands from Portugal to Moscow. But of course the disaster of the Russian Invasion in 1812, the unified resistance by Austria, Russia, Prussia as well as thorn in Napoleon’s side of Wellington and his campaigns in Spain, led to the Emperor’s defeat in 1814. He was sent to Elba in exile. In 1815 he was back from exile and galvanised the French nation once more under his leadership. The Allies knew they had to do something to prevent Europe being plunged into yet more years of warfare and so began to gather in the Low countries and along the Rhine ready to invade France. This process would take weeks – especially for the more distant Russians to arrive. Napoloeon refused to wait for that invasion. In June 1815 he assembled an army of 100,000 veterans of his wars on the Belgium Border at the city of Charleroi and attacked. He had spotted a flaw in the allied deployment. Wellington’s Anglo Dutch Army was arranged in the west of Belgium – west of the Charleroi to Brussels road. Blucher’s Prussians (Wellington’s ally) had his army to the east of that line. Napoleon realised that if he attacked right down that road – on the line that divided the allies he could cause chaos and confusion. Then he would try and destroy the Prussian army whilst keeping the British at bay. Once Blucher was running for Germany he would turn on Wellington. So on the 15th June Napoleon attacked up the high road. He took the bulk of the French Army with him towards Ligny where the Prussians were gathering. 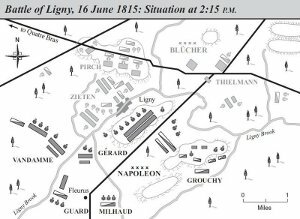 He sent Marshall Ney to Quatre Bras with orders to capture the poorly defended cross roads, hold off any British counter attack and send the bulk of his force along the road to Ligny to fall upon the flank of the Prussians and crush them. If everything went well Blucher’s Prussians would be destroyed before Wellington could react. That night Wellington was indeed distracted. He had been invited – along with the bulk of the officers to a ball in Brussels. That meant that at theÂ veryÂ moment when Napoleon was marching up the road from Charleroi the British were caught entirely off guard. When news reached the ball Wellington was already 18 hours behind the pace of the campaign. He at once sent his officers to gather the men and march on Quatre Bras. At the beginning of the battle Marshall Ney hadÂ 18,000 men and 32 guns with 2000 cavalry and faced only 8,000 infantry and 16 guns. These allied troops were Dutch regiments and although they fought well they were forced back towards the cross roads.Â Â Fresh British troops started to arrive two hours later as well as Wellington himself who then took command. Â As the day went on more and more British and allied divisions arrived until at the end of the battle – around 9pm, Wellington Â with 24,000 men had a numerical superiority over Ney. In those 6 hours the battle swung back and forth. The French launched a series of attacks – some of which reached the cross roads only to be forced back by a new allied division arriving and counter attacking. One famous moment was the arrival of the Duke ofÂ BrunswickÂ and his black uniformed cavalry complete with death’s head symbols on their shakos. Their charge repelled the French once again but at the cost of the Duke’s life. Another incident of note was when the Prince of Orange (a young Dutch prince with no battle experience) ordered the British to advance in line even though there were hordes of French cavalry around whoÂ promptlyÂ charged the British and slaughtered two battalions. Whilst the battle was raging at Quatre Bras Napoleon had the upper hand at the nearby battle of Ligny. All he needed to complete victory was for Ney to break through at Quatre Bras and send him more troops onto the Prussian Flank. Napoleon even summoned a reserve Army corps under D’erlon to leave Quatre Bras and join him but just as it was arriving at Ligny Ney ordered it back to Quatre Bras. Â So the French missed the opportunity to use D’erlon at either battlefield as it spent most of the day marching around the Belgium country side. Wellington too was unable to help out at Ligny. Blucher had to face Napoleon alone. The French beat the Prussians at Ligny and forced them to retreat but they had not crushed them. Never the less because the Prussian’s were retreating Wellington was obliged to follow suit and spent the 17th June moving his army back northwards. However becauseÂ theÂ Prussians were able to retreat in good order, Blucher would be able to bring three Army Corps to help Wellington 2 days later at Waterloo. So who won at Quatres Bras? In truth both sides claimed a victory and both sides had lost about 5000 men. Ney should have broken through early in the battle and Wellington was brilliant in defence and held him off but was unable to help Blucher himself. So it was a really a draw. 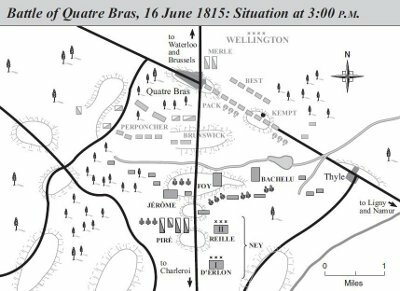 Quatres Bras and Ligny left unfinished business that would only be resolved 2 days later at a battlefield just south of aÂ smallÂ town called Waterloo. One of my areas of interest is the Napoleonic wars. My historical fiction is set at other time (The Saxon Period and the 17th century) but I find this periodÂ fascinatingÂ and I have visited all the battlefield of the Hundred Days Campaign and recommend them. Waterloo in particular is ideal for touristis but armed with a map and guide you can find much at Quatres Bras of interest.